However, the launch of the two new Legendary Servers on November 8th provided an interesting opportunity, economically speaking. 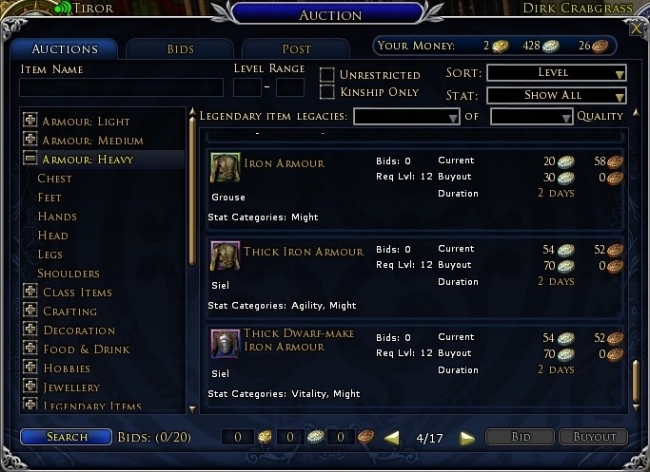 Some resources, perks and benefits in LOTRO are account wide, such as cosmetic items associated with the purchase of expansion packs. However, gold, mithril coins and skirmish marks are all server bound and can only be shared between alts therein. Thus, no one came to Anor and Ithil with the advantage of previously earned wealth. As a result, it has done wonder for these servers’ economies. Players are having to craft all the items they need and sell the surplus. There is also a healthy trade in the resources that sustain crafting. Two weeks on from launch and the acquisition of gold is still a relatively balanced process. Subsequently, buying new gear is still a viable option beyond that which you earn through questing. There are also lots of new kinships which support the needs of their members. So far, the game economy is not derailed. As ever, it will be very interesting to see if this balanced and broadly equitable situation continues over the month to come. Perhaps the release of further content in four-months’ time will alter the status quo. By then there will likely be a percentage of wealthy players at level cap, along with those who are doing “okay” and some who are neither at cap or have a proverbial “pot to piss in”. Such is the nature of MMOs and those who play them. The other thing to keep an eye out for on the new servers is the presence of gold farmers. As gold is not transferable between existing servers, it has to be earned from its current location. So far, there is not a sufficient surfeit of gold to be assimilated and “redistributed” by such third party “institutions”. This again main change when the Mines of Moria expansion is added to both legendary servers. In the meantime, I am already buying any potential bargains I find on auction house, not only for my primary alt’s current needs but for the future as well. It certainly is a pleasant change from the dearth of choice currently found on the older LOTRO servers.